When I wrote about giving up reading during Lent, I must have been subconsciously looking for accountability. Several of you have asked how it’s going - which means you are reading this blog (thank you!) and it means I have to ask myself what life looks like without my daily literature dose. So far, I’ve endured the fast from books pretty well; but surprisingly, I haven’t been reading my journals or the Bible as much as I thought I would. I’ve been working in the yard. I’ve trimmed overgrown shrubs and raked years worth of leaves and straw out of the flower beds. Morning and afternoons are spent hauling limbs and wheelbarrows full of debris to the curb until my pile on the street at sunset each day is the size of a compact car. Sometimes this cleaning up feels good and sometimes it’s exhausting and I wish I had more help or less shrubbery. Yard work is kind of like writing; you don’t like doing it, but you love having done it. The work I have to do to get there is dreadful, as told by sore shoulders, tired legs, and numb hands after repeatedly doing this; but the feeling of driving up and seeing the neatly trimmed boxwoods and pruned azaleas is rewarding. The Fatsia had overtaken the flowerbeds so the hydrangeas were hardly growing, much less blooming. The azaleas were leggy and large, swallowing up the gardenias, and shouting of my negligence the past few years. Things can’t keep growing if there’s no space. Living things need light and air. All this work has been good for my bushes and my soul. At first I was disappointed in myself for not reading as much Scripture or journals as I’d anticipated, but then I realized what is a typical pattern for me - Embodiment. Typically, I embody a change in some physical way before it works its way to the soul’s level. My exterior landscape has to be pruned before I can get to the inner landscape. In the past several months, I’ve been contemplating a new thing possibility in my life. When I prayed fearful prayers about pursuing it, the thought kept coming to me, “It’ll be easier if you back into it.” What does that mean? How do I back into something if I am intentional about moving toward it? Then came Lent which entailed this fast from reading books and taking up the practice of reading my journals and scripture. 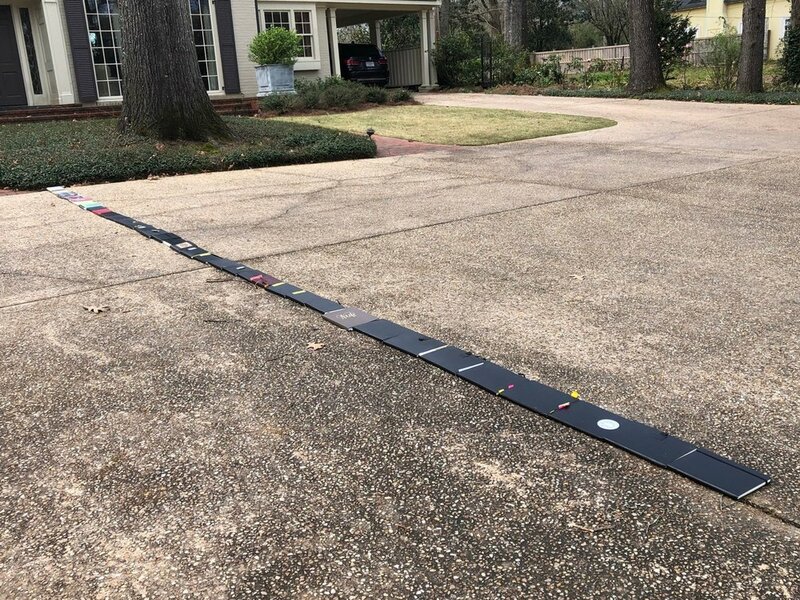 Before I started, I lined all the journals up in my driveway to see how far they would extend. I walked back and forth along that row of books, seeing months and years of my life all spread out in a line. It was tempting to throw some of them in the big green trash can, to forget the painful years, the doubt-filled months, the weak and petty voice that sometimes showed up on the page. But I didn’t. Instead I made a road : one I could back down that would take me to a new place. I’m being asked to remember. Remember the ways God has provided for me, protected me, led me, fed me, clothed me. Remember that I am dust and that He breathes the life into me. Remember that when I’ve been weak, He was strong. When I have despaired, He has been the lifter of my head. When I picture backing up, I think of looking in the rearview mirror. To read what I have written in my private moments- the good, bad and ugly - is to look backwards, to examine myself and God’s presence in my life. Though the enemy would tell me otherwise, these are my own psalms. Sure, there is plenty of lament and anger and “woe is me," just like David wrote; but there is more “look how God met me there,” how he cared for me and those I brought to him, how he provided for us all. Those books are filled with the goodness of God when I wrestle my way through ‘too much me’ to find it. I am being invited by Jesus to know him in his suffering during this season of Lent. On Easter morning, I will celebrate that He is the Wounded Healer, that freedom and liberation are mine because he did not back down from walking into the hardest thing of all. He faced every possible suffering so I would never be alone or powerless in mine. The “road” of books is now stacked up inside the house and I am slowly working my way through them. As I read, I ask for the grace to be as kind to myself as He is when I remember who I was in the past. He is meeting me there, showing me that though it is hard work dealing with what I’ve neglected in the past, pruning overgrown limbs and clearing debris creates space where the beauty and the new growth are coming in.